April | 2008 | Baking and Caking! So every few weeks or so we bring in muffins to my history class because it’s first period of the day. 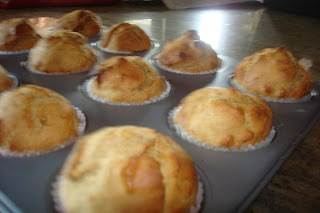 Last time I brought in cupcakes which were so good, but I figured cupcakes aren’t the best breakfast food, so this time iI decided to make muffins, specifically banana nut ones. The recipe came from the cookbook How to Cook Everything. It was very simple, but since it called for molasses instead of sugar and less milk because of the bananas, it was very thick, so in the end, I needed to add about 1/2 cup milk more then the recipe called for. 1. 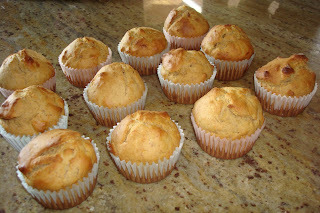 Preheat oven to 400* F. Grease a standard 12-cup muffin tin or line with muffin liners. 2. Mix together dry ingredients in a bowl. 3. In a separate bowl, beat together the egg, milk, butter or oil, molasses and banana. 4. Make a well in the center of the dry ingredients and pour the wet ingredients into it. Using a large spoon or rubber spatula, combine the ingredients swiftly, stirring and folding rather than beating, and stopping as soon as all the dry ingredients are moistened. The batter should be lumpy, not smooth, and thick but quite moist; add more milk or other liquid if necessary. 5. Spoon the batter into the muffin tins, filling them about 2/3 of the way full and handling the batter a little as possible. 6. Bake for 20 to 30 minutes, or until the muffins are nicely browned and a toothpick inserted into the center of one of them comes out clean. 7. Remove from the over and let rest for 5 minutes before taking them out of the tin. So for my prom last week, I decided to make a cake for the party we had afterwards at one of my friends house. 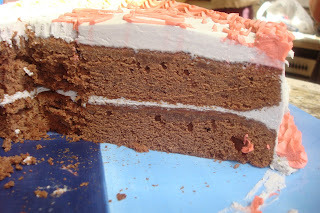 The cake was excellent, a chocolate butter cake, but the buttercream frosting was so light, that it didn’t really taste like buttercream anymore, more like fluff. Both recipes were from The Cake Bible, by Rose Birnbaum, but I think that in the future, I’m going to stick to the more traditional buttercream frosting I usually make. 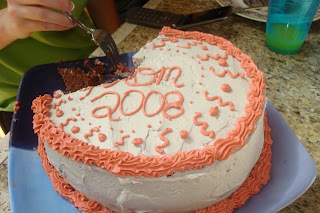 My dad said that this was one of the best cakes I’ve ever made, and he is a harsh critic. I forgot to take a photo before it was cut, but as you can see, I went a little wild with the frosting and food coloring. Some people decided to dig in right from the plate. One day while I was browsing the baking aisle at the supermarket, I saw that peanut butter chips were on sale, so naturally I bought a pack. 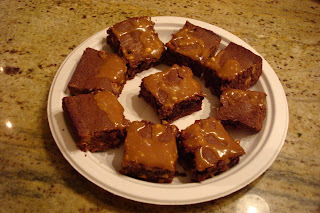 I found a recipe for Peanut Butter Brownies from Hershey’s. They were very rich and peanut buttery. The top glaze was a little gooey, and I probably would just leave it off if I made them in the future. 2. Stir together butter and sugar in large bowl. Add eggs and vanilla; beat with spoon or whisk until well blended. Combine flour, cocoa, baking powder and salt; add to butter mixture, stirring until well blended. Reserve 1/2 cup peanut butter chips for glaze; stir remaining chips into batter. Spread batter into prepared pan. 3. Bake 30 to 35 minutes or until wooden pick inserted in center comes out clean. Cool completely in pan on wire rack. 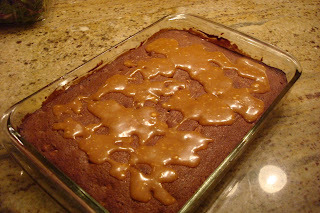 Prepare PEANUT BUTTER CHIP GLAZE; drizzle over brownies. Let stand until glaze is set. Cut into squares. About 32 brownies. 1. Combine 1/2 cup REESE’S Peanut Butter Chips (reserved from brownies), 2 tablespoons butter or margarine and 2 tablespoons milk in small microwave-safe bowl. 2. Microwave at HIGH (100%) 45 seconds; stir until chips are melted and mixture is smooth. Gradually add 1/4 cup powdered sugar, beating with whisk until smooth. About 1/2 cup glaze.